Moorfield Story et al. request the abolition of racial segregation in the federal departments. 7 WU JM 86 D.L. 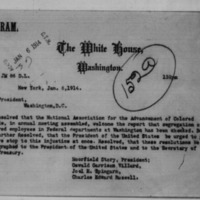 Resolved that the National Association for the Advancement of Colored People, in annual meeting assembled, welcome the report that segregation of colored employees in Federal departments at Washington has been checked. Be it further Resolved, that the President of the United States be urged to put an entire stop to this injustice at once. Resolved, that these resolutions be telegraphed to the President of the United States and to the Secretary of the Treasury. Storey, Moorfield, 1845-1929 et al., “NAACP to Woodrow Wilson,” 1914 January 6, CS01, Race and Segregation Collection, Woodrow Wilson Presidential Library & Museum, Staunton, Virginia.